Jam is a fun, weekly competition where all participants focus on racing one to three tracks, and their times from those tracks are combined to give them an overall placement. The first time you ever race in Jam, you start in Division 11, which is a qualifying division. At the end of your first round, you’re placed into your starting division based on your overall results. 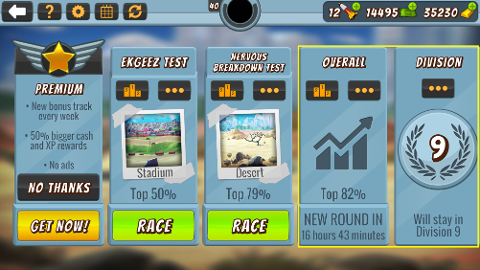 While you're free to attack times directly from the leaderboards, you can also simply hit the Play button on a Jam track card. When you do this, you’ll automatically be paired up against a real player whose time is slightly better than your best time. With each win, the play arrow will pit you against another slightly faster foe. 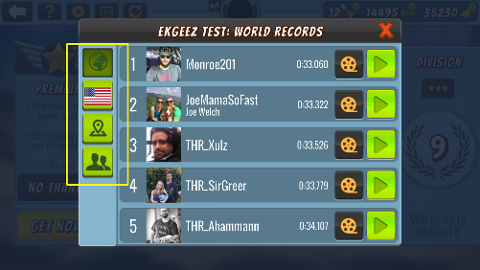 It’s a great way to slowly but surely climb the leaderboards and improve your time and your overall skills.